All meals are freshly prepared at the Merry Poppets kitchen by our own Professional Cook. 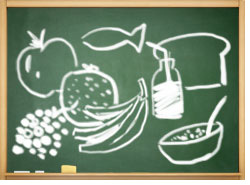 Our cooks recipes are carefully selected to provide a varied and appetizing menu, this is based on a Government healthy eating guidelines which ensures that over the course of the day our children get at least 5 portions of fruit and vegetables. The children get into the habit of eating unprocessed fruit and vegetables everyday by having snack foods like carrot sticks with dips or washed and cut up fruit such as apples in their skins. We ensure the menu is appropriate for very small children so there is no added salt and conforms to Government nutritional guidelines for very young children. We include healthy amounts of protein, butter, semi-skimmed, full fat and soya milk. For special diets we ensure substitutes are also highly nutritious and we have a mixture of meat, fish and vegetarian dishes on our menu every week. We purchase most of our food from reliable local farmers, by using a local supply chain it allows us to check the nutritional quality and suitability of the ingredients we use, as well as supporting a local business. However, when required, we do use a national supermarket chain. We understand young palates. Young children are more receptive to different flavours than some of us expect and we offer a varied menu with dishes from all over the world, a wide variety of meat, fish, vegetables, and pulses. We have a strict policy NOT to serve any “fatty junk food” such as chips. We do not use additives in our food and we don’t give the children sweets or chocolate. However, we do make our own tasty and healthy fruit cakes and some homemade puddings so the children get to enjoy these treats. We encourage the children to progress quickly from pureed food to “grown up” solid food as quickly as they are ready to, this means they enjoy all sorts of food much more as well as making life easier for their parents at home. The cook as well as our Nursery Nurses are trained in Merry Poppets meal time practise that ensures children don’t get foods they are allergic to or that their parents do not want them to eat. We have a very robust check system in place that is followed from kitchen to the table which safeguards this procedure. We help children to progress when they are ready from baby bottle to beaker and from beaker to cup. We encourage children to sit nicely at the table and move them from high chairs to sitting at the big table in a chair appropriate to their age. The children learn to feed themselves and we introduce a children’s cutlery as soon as they are ready to progress from a spoon. Parents are constantly delighted with the progress their children make at Merry Poppets Nursery, feeding themselves and learning to eat a varied diet and more grown up food. All the children eat together at regular meal times. Our Nursery Nurses eat with the children, encouraging good table manners and social skills. 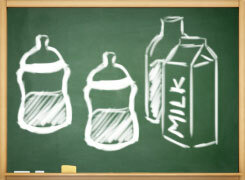 We welcome any parents to bring expressed milk to nursery, but bottles MUST be clearly labled with your child’s name. It can be given to your child at the times specified by you. We will record how much your child has had as part of our daily feedback to parents.